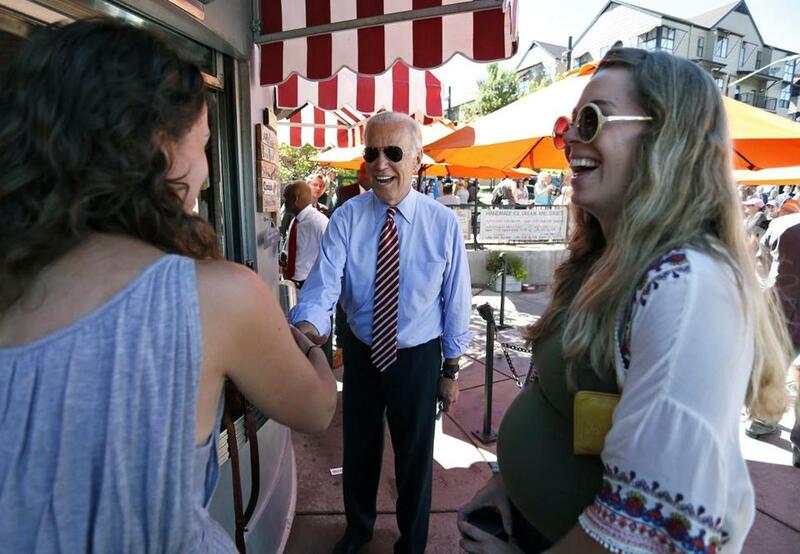 Vice President Joe Biden greeted customers during a visit to last week to Little Man Ice Cream in Denver. The vice president has revealed little publicly on the topic. In February he said that he would decide whether to run by the end of the summer, which technically is over on Sept. 23. Those close to Biden predict his decision will come in August. Kendra Barkoff, a Biden spokeswoman, said that speculation about Biden’s political future is “premature and inappropriate.” But by staying mum on the topic and allowing the conversation to continue, Biden may, some observers believe, be making his own statement of sorts. A Draft Biden committee — based in Chicago — is doing some legwork in early states. The group held a recent rally in Davenport, Iowa, that attracted about three dozen people. But the group raised a mere $80,000 in the last three months, and was invisible at the recent gathering of Democrats in Cedar Rapids. He said Biden wouldn’t need as much cash as Clinton, who has taken in $47.5 million since she launched her campaign in mid-April. Her campaign apparatus is so complicated, he said, that when she visits places like his state it feels as if she’s “putting the seventh fleet into position.” Biden, he said, would run a nimbler operation. Harpootlian, like others interviewed for his story, said that earlier this year Biden was leaning toward running. Then came the death of his son. Beau Biden was 46 years old when he died of brain cancer May 30. In April, New Hampshire activist and Biden booster Mary Carey Foley asked the vice president directly what she should say about his decision to run for president. “He said the plan was to let Hillary do her launch, make sure Beau gets better, and then he would make a decision,” Foley said. “I don’t know what the plan is now,” she said. Time is obviously an issue. Biden’s organization in New Hampshire is dusty at best. In Iowa, some supporters have just plain given up — including Dave O’Brien who has known Biden for more than a quarter-century but just signed up to help with Clinton’s campaign. On the money side, the Clinton campaign is moving quickly to lock down the big fund-raisers like HBO executive Michael Lombardo, who went with the Obama ticket last time. But if one judges the vice president by his public schedule — there are suggestions that he may be testing a Rose Garden campaign strategy, quite literally. That was Biden wearing a purple tie, hands clasped in front of him, standing next to Obama in the Rose Garden shortly after the Supreme Court upheld the Affordable Care Act. The next day the vice president was by Obama’s side again, this time in South Carolina mourning the death of nine worshippers shot to death. He stood by the president on the first floor of the White House when Obama gave a statement about the Iran deal. Last week Biden made a campaign-esque stop in Denver to highlight Democratic priorities. He visited the Community College of Denver’s New Manufacturing Center where he talked about the administration’s plan to reduce tuition costs. Then, accompanied by Mayor Michael Hancock, he visited a local ice cream parlor and ordered a scoop of salted Oreo, a local favorite. “I’m buying,” Biden declared when he arrived at the store. Biden’s press shop has been reinforced by one old hand — Mike Donilon returned to the vice president’s office in mid-June and is advising on communications issues. Supporters say Biden would bring to the campaign trail some qualities Clinton seems to lack: an obvious love of retail politics, a love of engaging in the issues of the day, and a sense of spontaneity. A pair of recent trips to Capitol Hill by the two exhibited the difference. The Clinton campaign swept through with an entourage that resembled a parade. Security kept her walkway clear, and those lining the route stood with back pressed against the walls. Biden also travels around the Capitol with Secret Service agents, but his movements are so low-key that on a recent afternoon he nearly collided with a reporter who was checking her phone while walking. Biden paused to avoid bumping into her — stopping just long enough for other journalists to surround him. Suddenly the vice president was holding an impromptu press conference of sorts. James Pindell of the Globe staff contributed to this report. Annie Linskey can be reached at annie.linskey@globe.com. Follow her on Twitter @annielinskey. Correction: An earlier version of this story misstated Joe Biden’s ranking in a recent poll. The story has been corrected to note that Biden was in a statistical tie with Bernie Sanders in the poll.